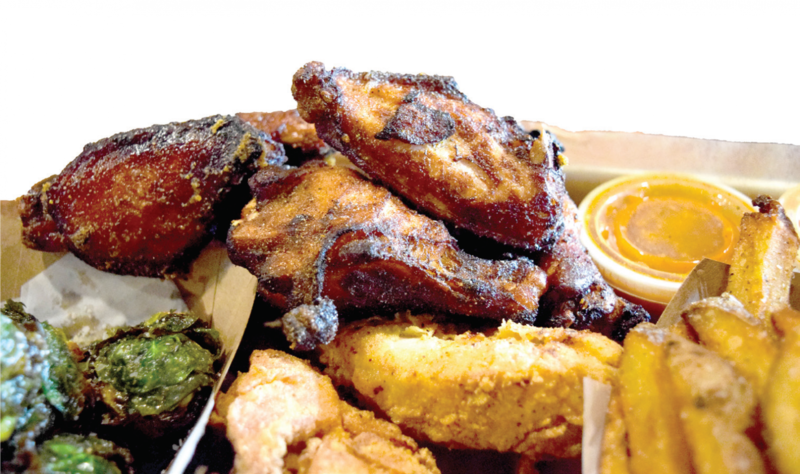 After getting their start at Boca Loca along burritos and chips, the wings and sides at Boss ChickNBeer now have their own address in the University Market. Boss ChickNBeer officially opened at the beginning of October, joining several up-and-coming businesses in Baldwin Wallace’s Front Street development. The new restaurant, which is located in the University Market building, happens to share something in common with another popular Berea spot just a two-minute walk away: Boss Chick owners Heather Doeberling and Emily Moes just happen to also be co-owners of Boca Loca Burrito Factory. In fact, Doeberling said that the idea for Boss Chick started at Boca Loca, when an almost-daily customer joked that if Boca Loca sold wings, he’d be a daily customer. This led them to start Wing Wednesdays, which Doeberling said has been a success over the past two years and sold out every week. Pretty soon it became clear that a wing spot might be in the offing. “After the first Super Bowl when we sold 300 pounds of wings out of a burrito place, I was like, yeah, I think these wings need their own address,” she said. Since the creation of Boss Chick, Boca Loca has retired its chicken wing offerings and is continuing on as a burrito restaurant, which Doeberling is alright with, she said. “Really, selling wings out of a burrito place doesn’t make a whole lot of sense, like who does that?” said Doeberling. Although the new restaurant does not accept Jacket Express like Boca Loca does — Boss Chick can’t since it sells beer — Doeberling and Moes said it is still a part of BW community. Boss Chick’s location in the university’s Front Street development make it a part of the newly established Berea Business District and the growing BW community. In a way, Moes said she hopes the restaurant helps bridge the two. Boca Loca started as a food truck in 2013, which Doeberling said was a “great way to start a mini-restaurant.” The agreement with BW to take Jacket Express at Boca Loca was established before the restaurant was open. While she said Boca Loca the restaurant was like an extension of Boca Loca the food truck, Doeberling said that the creation of Boss Chick was different because there was more unknown in building a completely new restaurant. Although Doeberling said “there’s a lot of crossover” between the two restaurants, Boss Chick is a diner with more of a “public house” feel. Moes said the restaurant will have a distinct atmosphere. Doeberling said that the public reception of Boss Chick has been positive, which may be, in part, because of her and Moes’ dedication to being contributing community members. Doeberling is from Berea and was intentional in choosing downtown for the location of Boca Loca and Boss Chick. Moes said that their success as female entrepreneurs has also led them to help other local businesswomen. Their start in food trucks, as well as continuing in the male-dominated restaurant industry, has influenced the brand and mission of the companies. “We don’t have cooks, and we don’t have servers. We have bosses. And we just do everything. Our uniform is a boss chain because it’s an empowering thing to be a boss and wear it on your chest,” said Doeberling.